This is a large open design ground floor one bedroom unit measuring 1,247 sq. ft, with a full bath, well equipped kitchen, dining and living room that have access to the common area pool. There is marble flooring through out & the bathrooms have detailed travertine tiles & modern sinks. The kitchen has state of the art appliances & granite counter tops. This one bedroom unit is perfect for 2 guests who want more than just a room. There's no need to eat out every night, you can cook any meal as elaborate as you want. Have a romantic dinner at home before going out & if you are lazy, cozy up on the couch and watch tv. 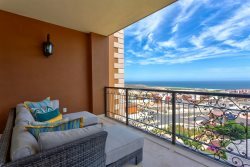 The building is located 75 meters from the best swimming beach in Cabo and across the street from Puerto Paraiso mall. It is a block from the marina and walking distance to everything in town. One Medano Beach is neighbors with Hacienda Beach Resort and a block from our favorite hang outs: Esquina Bar, The Office, Edith's, Billygans, Baja Cantina & Mango Deck. You have a personal LIFESTYLE Concierge who will greet you upon arrival and is on call during your visit. There is 24hr security & private entry codes & one space in the underground parking if you really want a rental car. You’ll enjoy a common area pool, Jacuzzi, outdoor grill and shower to rinse off after coming in from the beach. We offer many a la carte services also if you need, such as babysitting, private catering or drop offs are available. In addition, you’ll have access to discounted golf, fishing and many other activities when you book them directly through us. Last minute rescue during busy holiday season was very much appreciated! Hector and Rosa could not have been more helpful. Would stay there again! I always have loved my stay at One Medano-everyone that works there on a daily basis are very helpful and they always have a up beat attitude-if you need anything it is taken care of right away. Totally wonderful and I always miss them until I return.